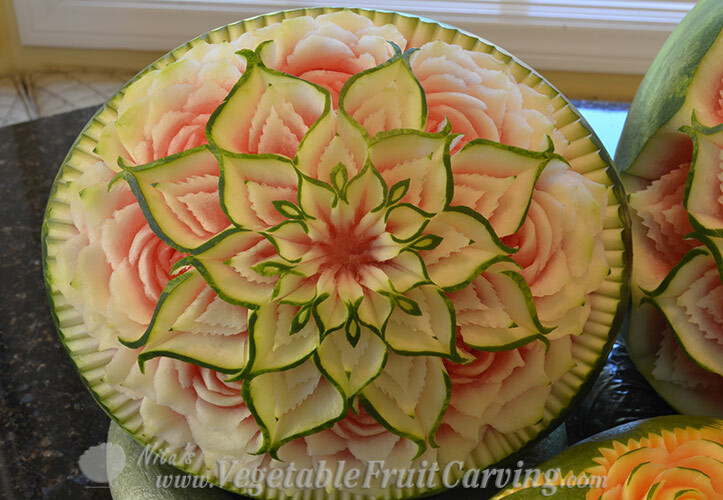 Here are my most recent Thai watermelon carvings that I made in preparation for the Thai Loy Krathong festival at the local Thai Temple which took place last Sunday. This was the first time, I’ve made this particular pattern. I made it in honor of my teacher. She gifted me the book that contains this pattern while on her deathbed. Quite literally. She was sick and in pain. 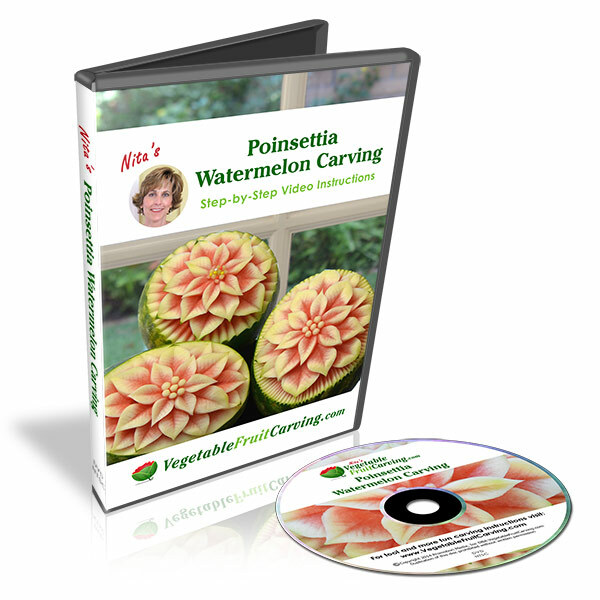 Yet, always the giver, she wanted me to have her carving books. 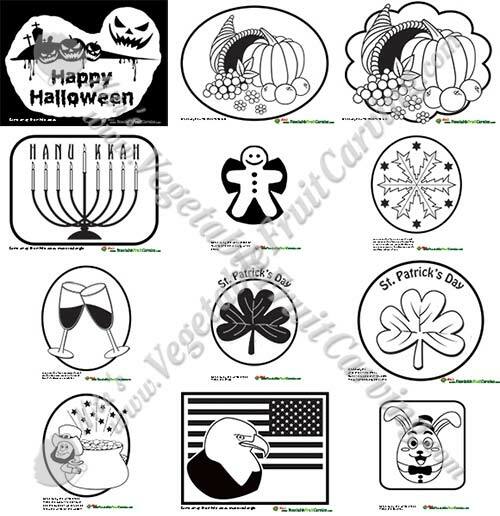 I made two variations shown below. My teacher, Thanom (Tammy) Sterrit always created a lovely booth to showcase the Thai art of fruit carving at each of the major Thai festivals. This year we wanted her tradition to continue. One of Tammy’s other students, Nujarin took on the responsibility to create this year’s booth at the Loy Krathong Festival. Several other students and teachers made carvings for it. It turned out absolutely beautiful. A riot of color. I’ll be sharing those photos with you when I have time after this busy weekend is over. In the meantime, you can see the carvings that I brought to contribute to the Thai fruit carving booth. 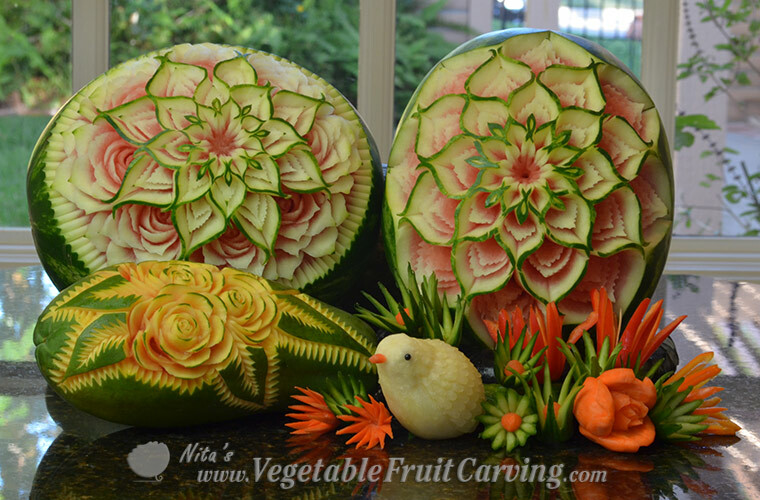 Here is a closer look at Nita’s Thai watermelon carving pattern. If you want to see these images larger, just click on them. This side view allows you to see the roses better as well as the various layers of the pattern. This was my first attempt at this pattern. This was my first attempt at carving this pattern. 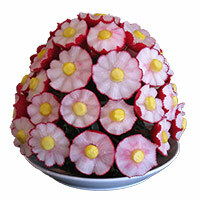 I just continued the inner pattern on the outer sections rather than making the roses. 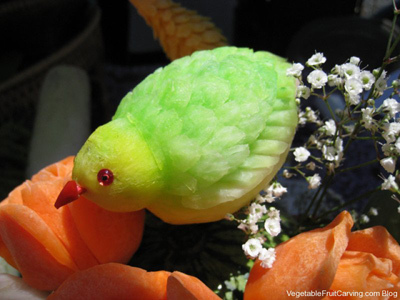 Close up look at the bird that Nita carved from diakon. This bird was something else I carved in honor of my teacher Tammy. 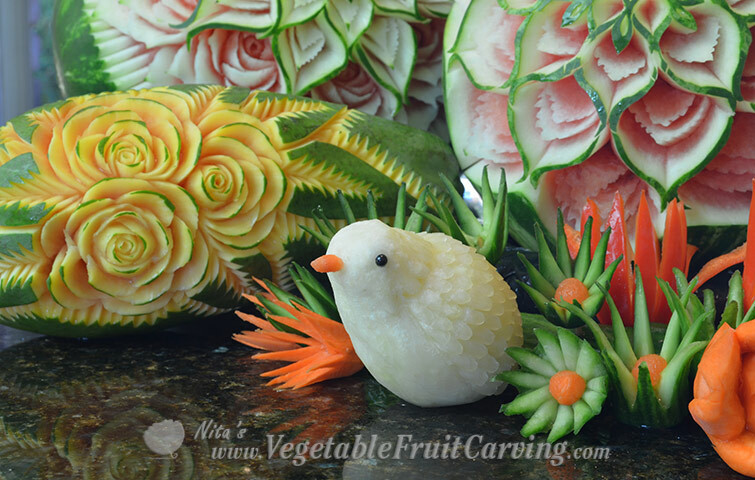 She had carved a similar bird for the Thai Songkran Festival that I shared with you in a blog post from a couple of years ago. 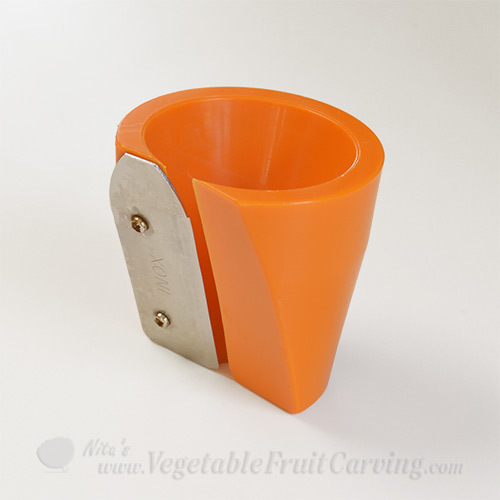 In case you are wondering, in the photo above, the green and orange-yellow fruit with the roses is a carved papaya. The green flowers are cucumber with carrot centers. 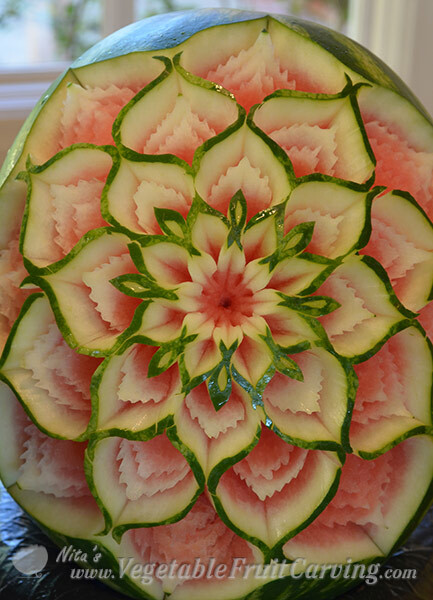 And, of course there are the Thai watermelon carvings in the background. In a few days, I’ll show you the photos of all the Thai watermelon carvings and other carvings at the Loy Krathong Festival. It really was gorgeous. You will see…. It is an excellent art work Nita!!! The carvings are stunning I could not take my eyes off them. You are very talented. Thanks Nirmala. Glad you liked seeing them. That is absolutely beautiful. God bless you Nita. Are you going to be offering classes on how to do this? I would love to learn how to make the birds. I’ve gotten a lot of requests so I will add it to my list of lessons to make. 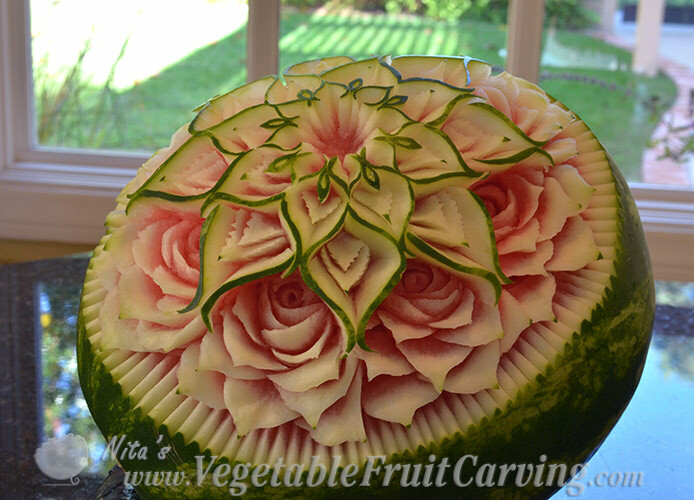 Its great to see such a beautiful carvings… thanks.